Benjamin Lowry over at AblogtoWatch.com just posted some stunning high resolution pictures of the New Black Bay Bronze. Go check it out! With the frenzy of Baselworld 2017 releases barely behind us, Tudor is at it again, this time partnering with storied Swiss watch and jewelry retailer Bucherer. 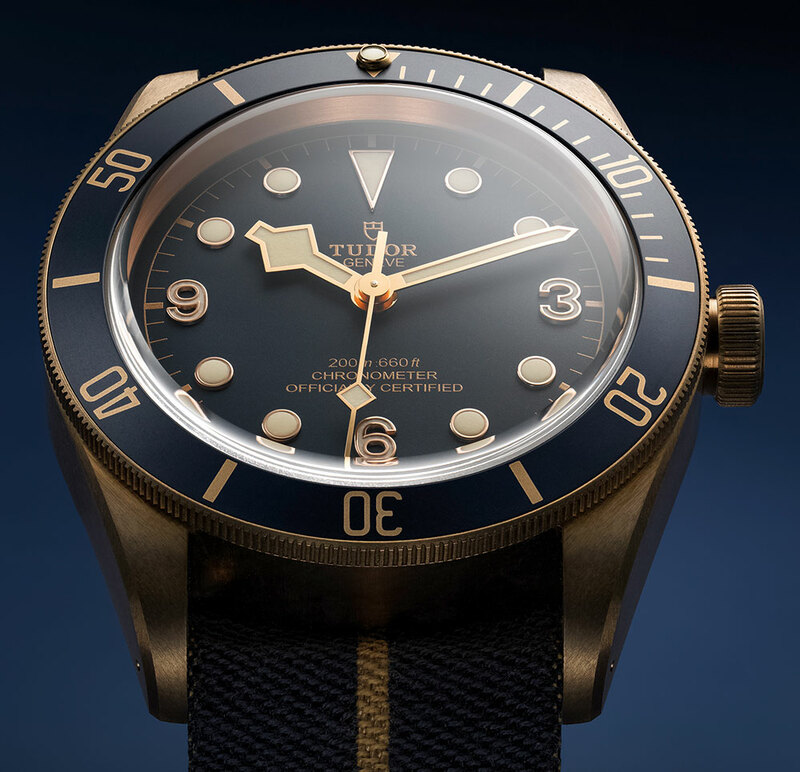 Tudor’s Heritage Black Bay series, which already includes something like ten different variations, is being further expanded with the release of the new Heritage Black Bay Bronze Blue. This updated model is part of Bucherer’s Blue Editions collection, an ongoing collaboration between Bucherer and some of Swiss watchmaking’s heaviest hitters like Audemars Piguet and IWC. The Tudor Heritage Black Bay Bronze Blue is also the Bucherer Blue Edition collection’s first real diver’s watch. The Tudor Heritage Black Bay Bronze Blue is essentially the same watch as the existing Heritage Black Bay Bronze (which we covered here) but with a deep blue dial and bezel. The new edition has the familiar 43mm aluminum-bronze alloy case, aged leather and fabric strap options as standard, no-date, vintage-inspired dial and hands, and Tudor manufacture COSC certified MT5601 movement with 70 hours of power reserve. This simple aesthetic update is in keeping with Tudor’s custom of releasing a new model and then updating it every year or so with changes in dial color, material, or more prominently with the addition of their new manufacture movement which is now seeing action in many of their watches. Tudor similarly updated their titanium Pelagos model with a blue dial and bezel in 2015 (in-depth review of the Tudor Pelagos here). Tudor is no stranger to the use of blue in their watches, especially their divers. The Tudor Submariner, which was issued to and used by the French Marine Nationale (Navy) and other military organizations, has been available in blue since 1968. Tudor’s military heritage is represented in the Black Bay Bronze by the inclusion of a fabric strap inspired by the straps used by French Navy combat divers. The use of bronze, however, is something relatively new in the world of watches. Bronze has long been used in a variety of maritime applications such as for boat propellers and diving equipment and naturally develops a unique patina over time. Bronze is catching on rapidly with the powerhouses of watchmaking, having been used by IWC and Panerai as well as many others.